~You can read in ANY language. Bring a friend! ~Everyone participates. Poets: come share your poem with us. Poetry lovers: share a piece that touches you! Now we are having public events at various venues in Israel, primarily in Jerusalem. Here are my poetry readings at Poets of Babel but more can be found on my YouTube channel or at the links below. Read more about the inception of Poets of Babel here. Join The Poets of Babel Facebook Page for photos, videos and updates! Feel free to contact Poets of Babel at poetsofbabel@gmail.com to participate or join the mailing list. 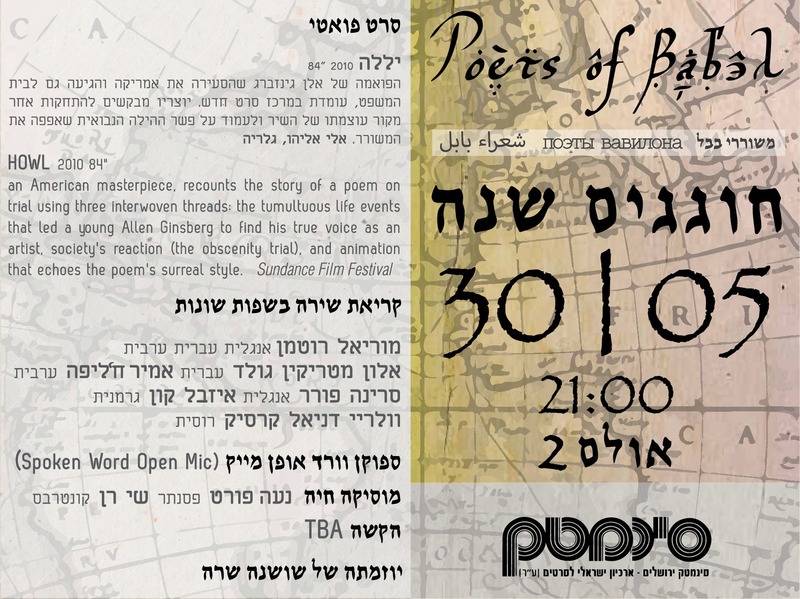 Poets of Babel Celebrates its 1 Year Anniversary at the Jerusalem Cinematheque! It’s a night with a poetic film (“Howl”), poetry readings in different languages (a trilingual poem [ Hebrew, Arabic & English], Hebrew, Arabic, Russian, English & German), and a spoken word open mic with live jazz music! Here is the post with videos from the Poets of Babel Anniversary event. 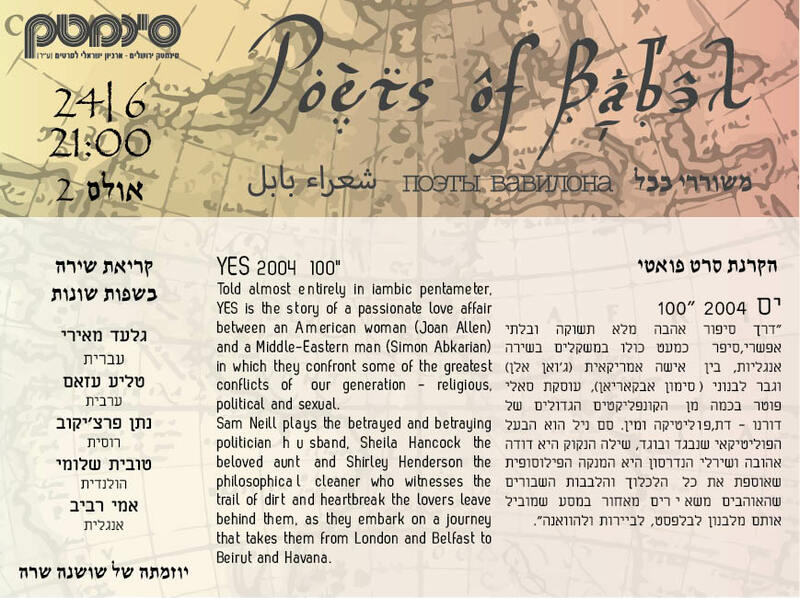 Poetry reading in Hebrew, Arabic, Russian, English & Dutch + screening of the film “Yes” (2004). Here are the videos for the Poets of Babel June 2013 event. Poets of Babel is returning to its roots with an open poetry reading + writing activities, for the first time outside! Hi Gila, Poets of Babel is in Jerusalem, Israel. 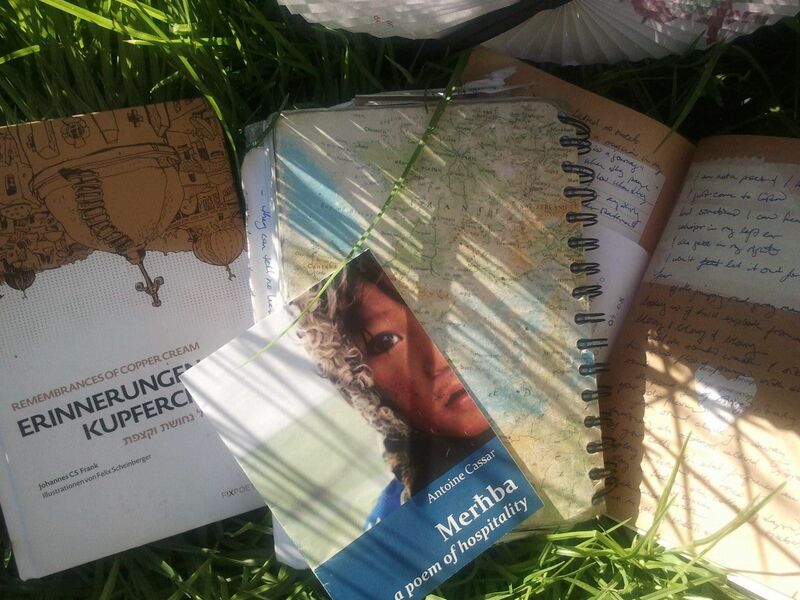 The publications are Shoshana’s, the founding poet of Poets of Babel (me!). There is a link for my publications on this site (https://shoshanasarah.com/publications/ ). There are also videos here (https://shoshanasarah.com/poetry-readings/poets-of-babel-readings/) and on the YouTube channel (https://www.youtube.com/user/ShoshanaSarahLJ/videos) from Poets of Babel events and my performances there or at other poetry events. Thanks for your interest!